Hawaiian Airlines is working to improve a 6.5% slide in inter-island unit revenues during 1Q2012 driven by its own significant capacity expansion through the creation of a hub in Maui that debuted in Jan-2012. 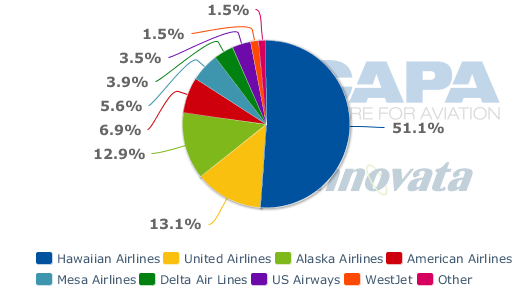 The weakened revenue is significant since Hawaiian has a roughly 80% share in the major inter-island markets, and the region has historically served as a position of revenue strength for the carrier. Unlike during the mid-2000s when US regional carrier Mesa Air Group debuted its inter-island subsidiary go! with unsustainable fares, which created instability by being a third entrant in the inter-island market and pressured revenues for Hawaiian and Aloha (which went defunct in 2008), the latest challenges Hawaiian faces are of its own making as it increased capacity significantly in the market at the beginning of 2012. Hawaiian opted to transition its operations at Maui’s Kahului Airport to a full-fledged hub in Jan-2012, ambitiously boosting its capacity between Maui and the neighboring islands by 25%. Its daily roundtrip flights from Maui are increasing by seven services to 36 on peak travel days and from 27 to 34 roundtrip flights on off-peak days. Overall, the carrier is targeting an increase in its inter-island service from 157 to 180 daily flights on peak days and from 143 to 168 on off-peak days. The increased capacity was supported by the addition of three 123-seat Boeing 717s, which resulted in the carrier growing that fleet type to 18 aircraft. Hawaiian already had a strong and established presence in Maui, and currently accounts for 51% of the seats available at Kahului. Inter-island markets represent the top for city pairs in Hawaiian’s largest domestic markets. During a recent discussion with analysts Hawaiian’s management did not admit miscalculating the projected demand on the increased service, but did acknowledge the carrier did not do a good enough job during 1Q2012 adapting to the substantial service pattern changes it made in the inter-island network. Hawaiian’s inter-island revenues only grew 3.5% year-over-year in 1Q2012 on 10% capacity growth. The revenue growth during 1Q2012 is significantly lower than the 12% increase in inter-island unit revenue Hawaiian recorded during 1Q2011. Hawaiian likely believed a rise in connecting traffic from its own long-haul expansion and traffic flows from its partners (who serve Hawaii but not inter-island traffic) would support the additional capacity in the inter-island market. During the last year Hawaiian has made a push into Asia, launching flights to Tokyo Haneda, Osaka, Fukoka and Seoul, South Korea from its Honolulu hub. On 05-Jun-2012 the airline debuted new long-haul flights from Honolulu to New York. 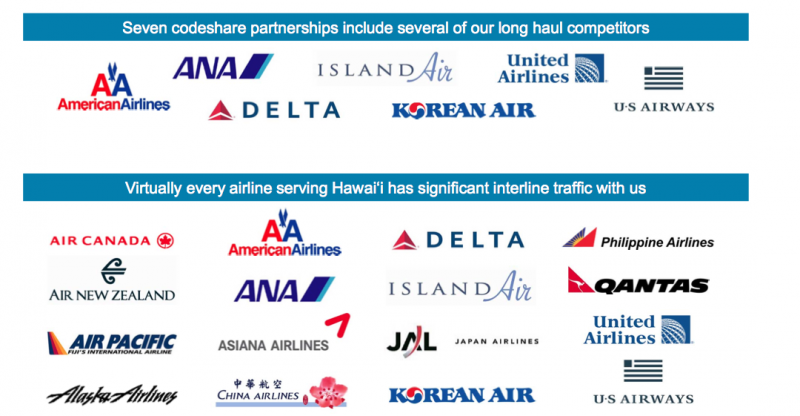 Hawaiian also has seven codeshare partners and 16 interline agreements with other carriers that feed into its inter-island network. Its latest interline partner on those flights is JetBlue Airways. 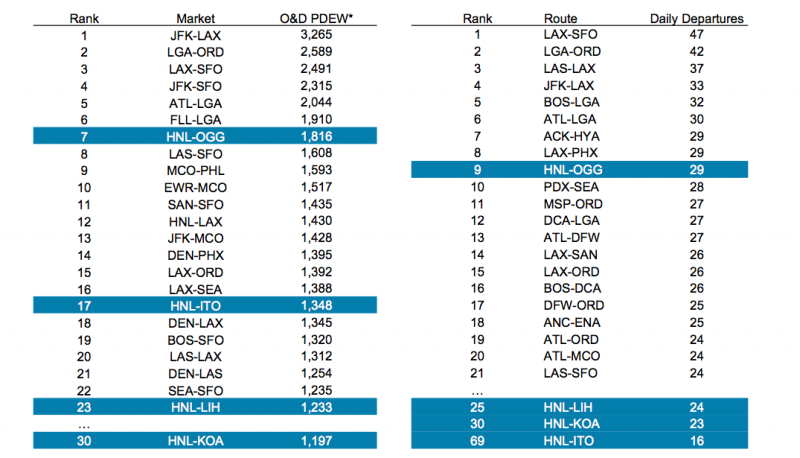 Hawaiian caters to a mix of passengers in its inter-island network, and connecting passengers are key to making the economics of those flights favourable. The carrier designs its schedule on the major routes including Honolulu-Maui to accommodate the peak travel times for each type of traveller – connecting leisure customers, business travellers and state residents – between the islands. The service expansion in Hawaiian’s inter-island network that began in Mar-2012 includes new daily flights from Maui to Kauai, additional flights from Maui to Hilo and Kona, which the carrier said would eliminate the need for stop-overs to connect in Honolulu. Hawaiian has no competition on its flights from Maui to Hilo on the main island, and competes with go!mokulele and Island Air on service from Maui to Kona and Kauai. Both carriers operate smaller aircraft on the route as go!mokulele flies nine-seat Cessna Grand Caravan 208Bs and Island Air flies 37-seat Dash 8 100 turboprops. Hawaiian overestimated the connectivity to inter-island markets from its new Maui hub. Carrier CEO Mark Dunkerley remarked that Hawaiian anticipated traffic would flow relatively easily over the new Maui hub versus Honolulu. However, Hawaiian has discovered that “people are kind of more set somewhat in their ways than we initially anticipated”, he stated. 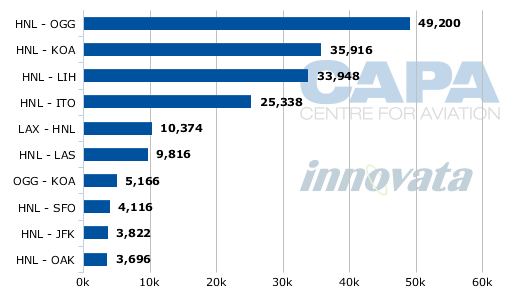 Hawaiian’s own estimates show that passenger flows from Maui is substantially lower as flights from Honolulu to Maui, Hilo, Kauai and Kona account for four of the top 30 US origin and destination markets based on passengers per day each way. Honolulu is a major business hub for the Hawaiian islands, and many residents take trips from other islands by air for shopping and other necessities including medical appointments. With its smaller size and greater focus on tourism, Maui does not have the same traffic draw as Honolulu. Mr Dunkerley explained Hawaiian during 2Q2012 is focussing on narrowing the unit revenue gap created by its additional capacity in the inter-island markets. He stated the carrier would tweak its schedule in Maui to better connect with long-haul services, which for Hawaiian includes flights to the California destinations of Los Angeles, Oakland and San Jose and Seattle, Washington. Its partner Delta operates flights from Los Angeles to Maui, joining United on the route, which also offer service to Maui from its San Francisco hub and two weekly flights to Kahului from Denver. Hawaiian also partners with US Airways, which operates flights to Maui from its Phoenix hub. Hawaiian also needs to bolster its promotion of the new Maui hub, said Mr Dunkerley, along with making fare adjustments and changes in its sales and distribution strategy for the increased flying. 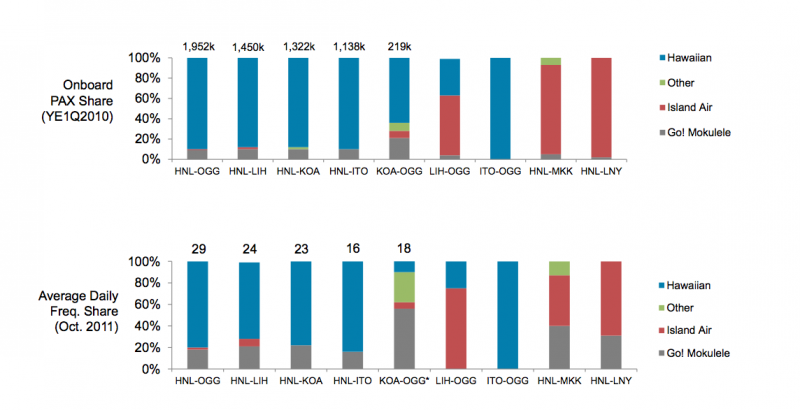 Previously, Hawaiian has explained that the true origin and destination segment of its inter-island flying is “low income elasticity demand”. Perhaps the carrier priced the expanded service too high and demand fell off, which created the weaker revenue performance. The cheapest roundtrip ticket on a Hawaiian non-stop flight from Maui to Kauai for travel from 18-Jun-2012 to 20-Jun-2012 is USD220, and USD194.60 for travel further out during 16-Jul-2012 to 18-Jul-2012. Mr Dunkerley believes Hawaiian can right the course in its inter-island network and begin narrowing the revenue gap in 2Q2012, but warned the hole would not be addressed entirely. 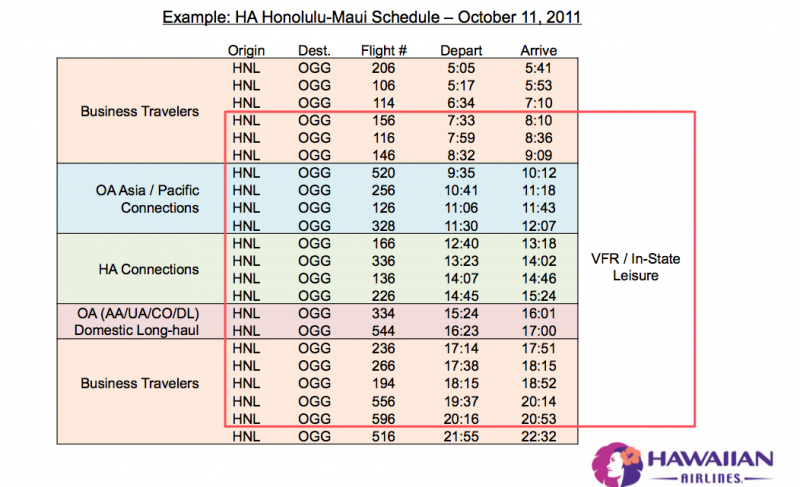 He is comfortable Hawaiian will have the right level of capacity in the market place during peak travel time in 3Q2012, with schedule adjustments during 4Q2012 “to completely address the issue”. Even as it adjusts capacity the three additional narrowbodies will remain in the carrier’s fleet, creating cost headwinds if the aircraft are underutilised. Having just acquired the aircraft, it is not likely Hawaiian can easily rid itself of the three 717s, so it will need to find ways to make those aircraft profitable, which could be challenging if fuel and global economic uncertainty continue to pressure demand and revenues. Lowering prices too greatly will result in sacrificing yield for load factors, which will continue to pressure unit revenues in its inter-island network. Despite the disappointing performance at Hawaiian’s new Maui hub, the carrier’s management remains committed to the strategy over the long term. “We’re not trying to put the genie back into the bottle,” remarked Mr Dunkerley. “We remain absolutely confident that the strategy we adopted is the right strategy.” Hawaiian does not have infinite time to demonstrate its calculus was correct.